Thank you for you interest in Wooden Kiwi Productions and our kiwiFLOOR sprung subfloor system for dance studios. The kiwiFLOOR is an extremely affordable permanently installed sprung subfloor ideal for a wide range of movement activities. We have been in the business of dance flooring for over 20 years, and our floors are unmatched in the industry for consistency, dynamic response and feedback to dancers. 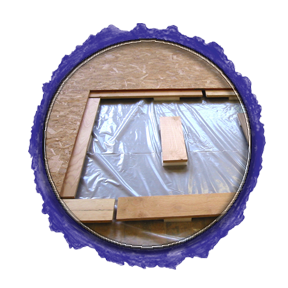 Our kiwiFLOOR Studio System combines the structural support of Oriented Strand Board with the spring and durability of closed cell foam pads. It can be installed over virtually any existing floor by securing the perimeter of the new floor to the old and then laying the pads and panels and interlocking them on specially constructed sleepers. At a total height of 2 1/2", when it is sealed and planed, the kiwiFLOOR sprung subfloor system makes the ideal sprung subfloor for any finish floor surface, including vinyl/pvc "dance floors," hardwood, tap tiles, and gymnastics matting. Unlike many products available, we support panel edges continuously along all edges, even staggering size of foam pads to assure consistency. Other products are designed to allow the panels to move against each other, resulting in an unpredictable response from the floor. Dancers have confirmed this, and test results have borne our assertions. For studios that need a temporary or removable floor, the Rosco SubFloor panel system is the modular version of the kiwiFLOOR.